It really is Monday and not Tuesday, so you may be wondering why I have a new blog post to share. The reason is actually quite exciting! 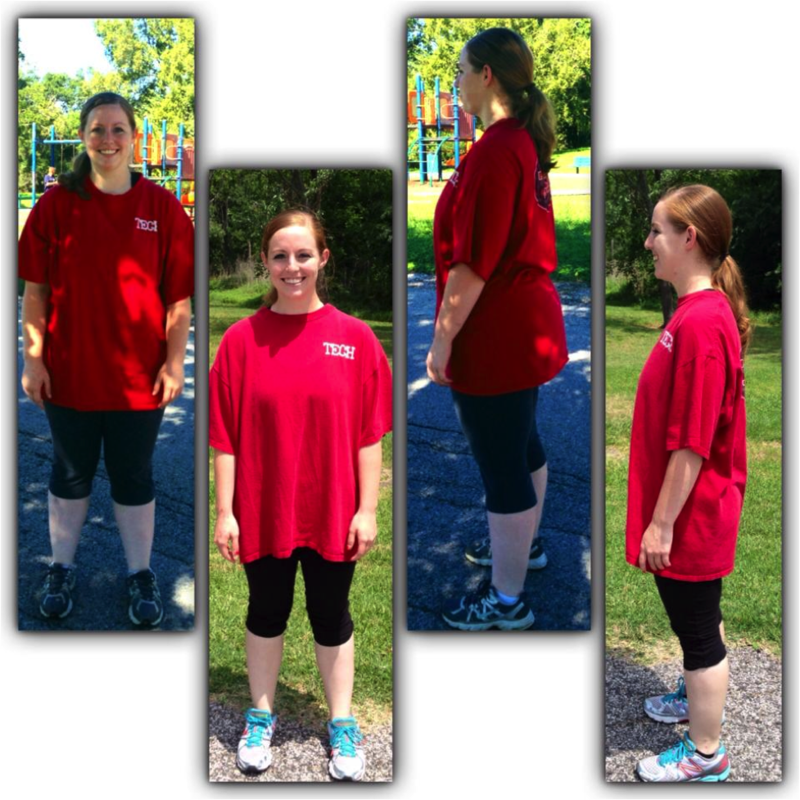 Over the weekend, one of my clients, Meredith, sent me the story of her fitness journey. I know I’m going to probably have to cut her testimonial down to make the length appropriate for my Praise page, however, I love it too much right now to do that. I hope sharing the full story will be a great way to help you start your week off right and that’s why I’m presenting it to you today for some Monday Motivation. The best part of this story to me is that even though Meredith moved in April, we’ve started working together over Skype! I’m so lucky and excited to train with her tonight while she’s on a business trip. Ok, I really better stop blabbering, but I hope you enjoy this! “I’ve always been wary of internet match-making websites. I mean you never know who is truly talking to you (think Catfish). It is kind of ironic, therefore, that an internet search is exactly how I first got connected to Catherine and Fit Armadillo. I was looking for a personal trainer, because I got on the scale for the first time in a while and the number scared me. I, also, was moving, so I had the time to workout and less temptation to eat out with friends (didn’t know anyone but my boyfriend’s parents). I absolutely HATE working out, running, and ESPECIALLY dieting. I mean, come on, pizza, chocolate, Chinese food, etc. etc. tastes TOO good and the couch is just really comfy. It’s not fair. However, like I said, I knew I couldn’t keep going on the path I was going on. Now, I played some sports in high school, which appealed to my competitive side, but I am just not motivated AT ALL by drill sergeant, tough-love, scream-in-your-face type figures. As I said before, I didn’t really know anyone in Houston and, therefore, had to take this HUGE risk. I, being a “tight wad” searched mainly on price, someone who would work with where I lived (I lived outside of Houston), and schedule. Catherine fit that the best. Talk about luck of the draw. First of all, she met with me in person before we even started working out, so we would have a little time to get more comfortable with each other. I mean she was going to see me struggle. I will try not to over share, but ya..I was pretty embarrassed about the state of my fitness and my sweat-to-girl ratio. From the get go, however, Catherine was very professional and, most importantly, kind. She went through my goals, my fears, my “limitations”, and even went as far as to get me a Starbucks drink! 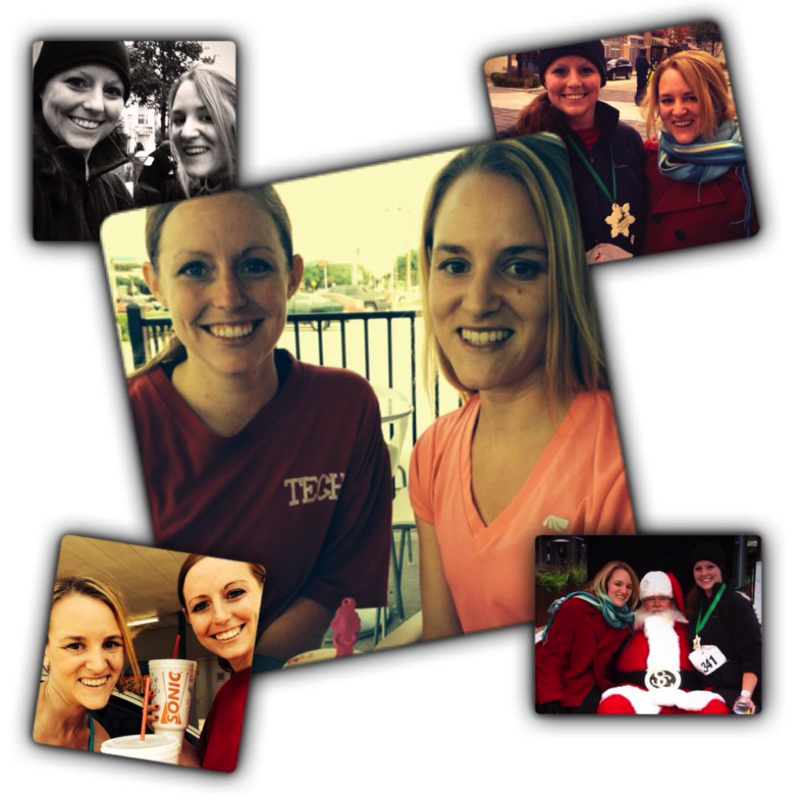 Enjoying runs, frozen yogurt, tasty toasts, and hanging with Santa together. In my head, I was thinking this is the calm before the storm, but not at all. I told Catherine one of my goals was to run a 5k that was coming up in December without stopping to walk. 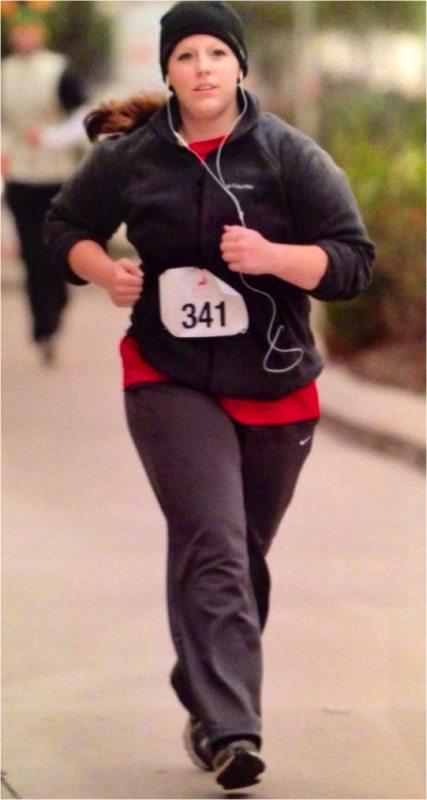 May seem small, but believe me for a girl that HATES running it was quite an ambitious goal. Catherine not only gave me a slow and steady workout schedule to get me ready for the race without burning me out on running, she came to the race (in the extremely cold weather…odd for Houston, but yes), got me band-aids for my blisters I incurred along the way, recommended shoes to prevent those same blisters, and SWEETLY challenged me to go for the Disney princess half-marathon one day (she knows I love Disney). I won’t say I love running now, but Catherine definitely made my relationship with it a little less bitter. I run about three times a week now. It wasn’t just with running that Catherine had an influence on me. She traveled to a park to met me weekly to workout. I will be 100% honest. I actually looked forward to these workouts. She made them as quick and painless as she could while still giving me a great workout. The thing that was amazing was it felt more like visiting a friend than working out. We would laugh, talk, and tell funny stories and I’d wake up the next morning with sore biceps and legs from planks and lunges not even remembering going through a 30 minute workout. That’s what I am talking about! A workout that is so fun, it feels like five minutes instead of 30! Catherine, knowing I had weight loss goals, also gave me a realistic weight loss goal per week and measured me every once in a while saying inches would prove more than pounds. It was a revelation to me and, with Catherine’s help, I lost quite a bit of both. I’ve lost about 70 pounds and 40 inches (waist, arms, and such)! Keep in mind that, in the after picture, I am wearing a size SMALLER brown shirt than in the before. 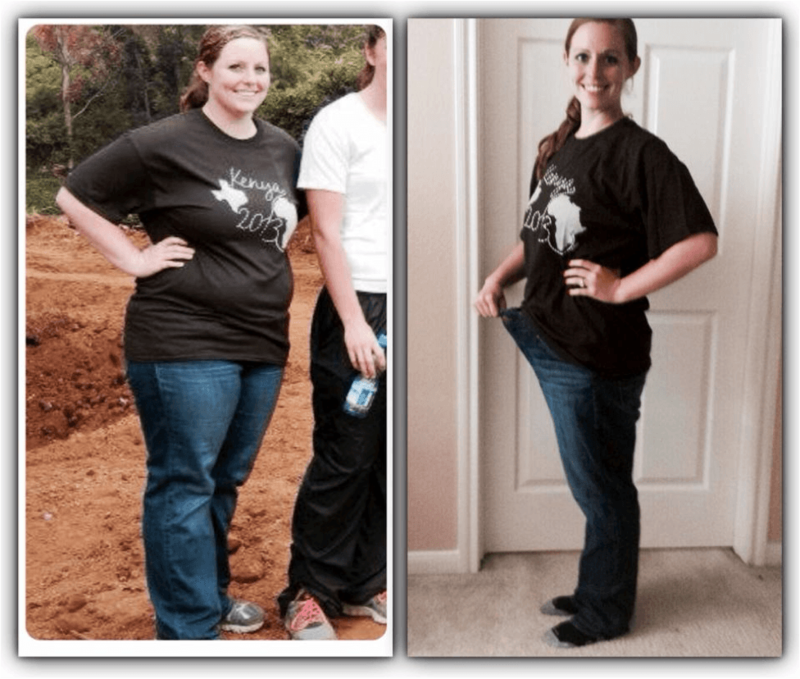 The before picture was taken in June of 2013, I started with Catherine in September, and the left was in April of 2014. I moved, again, for work and “losing” my “workout dates” with Catherine was one of the things that I was really sad about. They had gotten that enjoyable. Yes, I did most of the work on my own during the week (I like to workout alone), but I’d meet up with Catherine every week for a new, fresh workout. Perfect end to my week and I was not going to have that anymore. After about a month in my new town, I am happy to say that Catherine found a way to reach out and connect with me again. Guess what? It was through the World Wide Web again. This time, though, it was with Skype. I am so happy to be working with Catherine again. I NEVER thought I’d feel so guilty on “light workout days” (meaning, other than Sunday, I workout every day. Instead of counting climbing 5 stairs or reaching for my chips as working out). I have come full circle! I know that this NEVER would have happened without Catherine. She was there encouraging me, sweetly challenging me, and helping me the entire time. I NEVER would have stuck with working out or dieting if she would have been anything less than what she is. Seriously. With the drill-sergeant way, I may have made it a month. Maybe. Even then, it would have been a “fad” change. With Catherine’s steady, fun, but still challenging style, I can see this being a lifestyle change. Picture is of one of the first workouts to one of my last in Houston with Catherine. This is even more exciting because, not only am I more healthy, but I gained a person that I consider a true friend out of it. It gets even better. I got engaged in February and, because of Catherine’s encouragement and my hard work, I am even more excited to walk down the aisle feeling my best! Yes, she is invited! Smiling for the camera with her hubby to be! I know Meredith gave me a lot of credit here, but she’s also very dedicated herself and was and still IS a pleasure to work with. 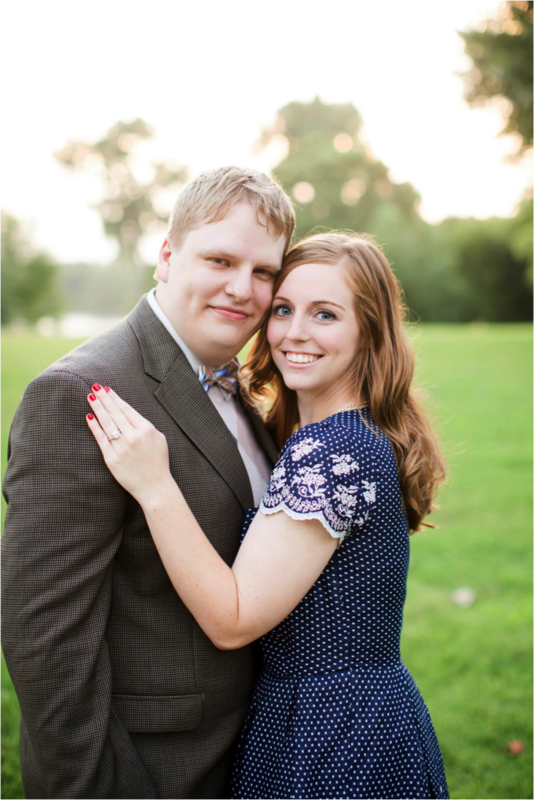 Thank you for stopping by to read this amazing testimonial and story! I hope it was a good piece of Monday motivation for you.